Hello Everyone. I have created a database and linked it with my php page. I have created some users, now what i want is to display the different courses to different users. 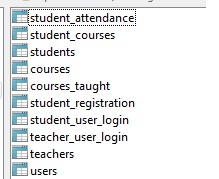 But when I am trying to apply a join query it is displaying all the courses from the courses table. Cn some one help me out? that is my code which i am writing for it.